That reminds me of macrame, but in a good way! I did this out of the same yarn that is our advent calendar, stockings, and a few other Christmas things. Very quick, and festive too. I love the yarn flowers!! I mean that it is super quick(although I didn’t time myself, it was only a couple of not intense at all sessions of crocheting the flowers (and I’m no good at crochet, so I’m slow), and a little time to wrap the yarn around the wreath form. I just used pins to attach the flowers (stuck through the center of sequins). If you’re interested, the pattern to the flowers is in Crochet Today holiday edition. 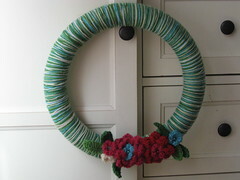 Do you have a link to give instructions on this nice wreath?